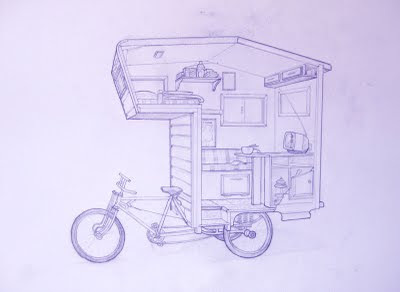 I've had a bizarre idea now for about a year (one of a number, it has to be said) concerning the adaptation of a bicycle into a kind of mobile home. Obviously, this makes no sense at all: why not simply put a tent in a pannier, ride to one's destination and erect said canvas dwelling? Much more sensible. Nonetheless the idea (as bizarre ideas are wont to) persisted. The very thing I'd imagined! How extraordinary! Investigation, however, revealed that this is a 'sculptural art object' fabricated by a gentleman called Kevin Cyr (more details here). Shame! I'd really like one. Office adjoins council fields and traveller's van parked outside. 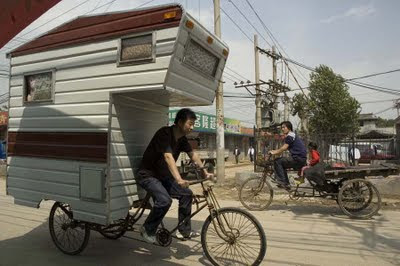 That shape entirely, but a camper, with a scooter and 2 bicycles lashed on the back. How is this coming along for you? I arrived here because I, too, am interested in the Camper Van Bicycle notion.